The eighth day of the Feast of Sukkot marks the joyous celebration of the turning over of the Torah (Simchat Torah), where the study of Deuteronomy has been completed and study of Genesis is begun. This is my third year of reading/studying the Torah in lockstep with the Jewish reading plan, which partitions the first five books (Torah) into sections (or parashat) that are read over the course of a single year. That “not exactly” has taken some getting used to, and only after going through it a second full year, last year, is it starting to make more sense. If you look on Root Source we have a channel called Shabbat Shalom, taught by Sondra Baras, where you will find 58 Torah portion teachings listed. Part of Gidon’s “not exactly” is found in the fact that the Sabbath during the week of Passover and the week of Sukkot have special readings on Shabbat. But to keep it all straight is pretty easy, because the first article of our newsletter each week lists the Torah portion reading for that particular week. This is always our first article in the newsletter, as a way to honor God and put Him first. In addition we list the Haftarah reading, which is usually from the Prophets, or Nevi’im. Besides the actual readings, I have in each of these three years, decided on a commentary to go with my reading. The main purpose of this article, then, is to share my experiences with each. The first year, I focused on the ArtScroll Chumash. The word “chumash” is Hebrew for “one fifth,” which refers to the Five Books of Moses. ArtScroll is a well-thought-of English translation that uses words that are consistent with traditional Jewish understanding of the scriptures. It also includes an almost verse-by-verse commentary that chooses some of the most often cited commentaries on each verse from over a dozen famous rabbis through the ages. 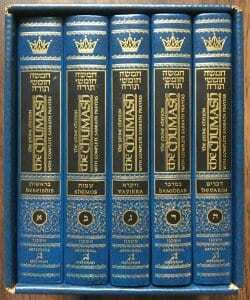 The ArtScroll Chumash I use is a five-volume set — one book for each of the five books of the Torah. While reading a Torah portion straight through might take only an hour per week, to go through every word of the ArtScroll meant that the Torah portion study would take at least four hours, at least for me. The second year, I began to study the Midrash of Paul along with the Torah portions. So my commentary needed to be much shorter. 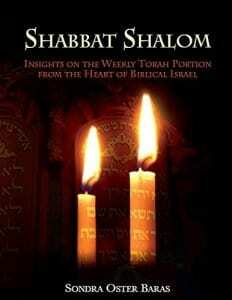 I found a nice solution with a book by Sondra Baras called Shabbat Shalom. She writes one brief essay that can be read in just five minutes, usually tying that Torah portion to something related to Biblical Zionism, and the development of the heartland of Judea and Samaria. While we do carry Sondra’s teaching series on the Torah portions on Root Source, her book is different from the teachings, although the name is the same. You can buy her book here. 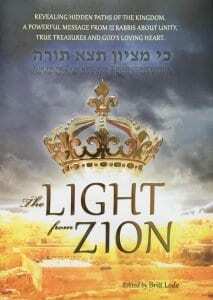 But this year, it is my joy to begin a jewel of a book, that was the brainchild of a Christian woman from Norway, Britt Lode, called The Light from Zion that brings together the work of twelve rabbis, each writing on several Torah portions during the year. This book is larger and longer than Shabbat Shalom, but not overly so. I expect the essays to only take about 10-15 minutes per week. The writers include: Rabbi David Aaron, Rabbi Dr. Nathan Lopes Cardozo, Rabbi Levi Cooper, Rabbi Yehoshua Friedman, Rabbi Moshe Goldsmith, Rabbi Moshe D. Lichtman, Rabbi Gedalia Meyer, Rabbi Chanan Morrison, Rabbi Zelig Pliskin, Rabbi Chaim Richman, Rabbi Shlomo Riskin, Rabbi Naphtali (Tuly) Weiss, Gidon Ariel and Rabbi Abraham Isaac Kook. God wants our obedience and our hearts, that we walk humbly with Him… So the question is who can teach us how to walk the paths today? Who can teach us everything that God has commanded us? 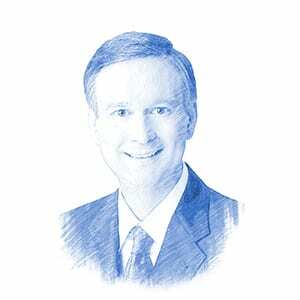 It is a very long time since the revelation at Sinai where Moses received the commandments from God, so where can we find the knowledge and wisdom about them today? Baruch Hashem (thank God) God has organized everything very well in His Kingdom. The King Himself has entrusted the tribe of Judah, the Jews, with the very words of God. He gave them the authority and mandate to administer and take care of the law (Genesis 49:10). And He has kept the Jews alive… They did not “get lost” like the other ten tribes. They have preserved the Torah very well, not even one generation has failed in protecting and keeping the wisdom and treasures of the Torah and in passing it on to the next generation. 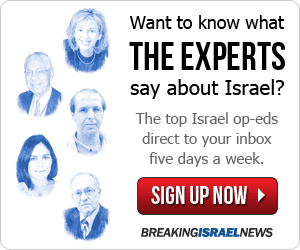 Today’s rabbis are the representatives for the Torah, the law, in our times. They are our connection to Moses and Mount Sinai. You can purchase this book from Root Source here. Because millions of people are reading these passages in the same week that I am reading them, I feel part of something much larger than myself. Because generations upon generations have been reading these passages every year, over time, I feel part of something much longer than my own lifetime. The detailed instructions concerning the building of the tabernacle and the service of the priesthood are starting (just starting) to reveal their beauty and intent. I am discovering just how much of the rest of the Bible is hidden in the Torah. You may have heard it said that everything in the New Testament can be found hidden in the Old Testament. But have you ever heard it said that everything in the Tanakh is found hidden in the Torah? The Torah is the seed for everything else, it seems. The Hebrew Calendar is God’s Calendar. I have begun to see how the work God does on the earth is synchronized with the calendar he created. The result of my Torah study has caused me to feel much more “aligned” and less surprised with the work that God is doing on a larger scale, through the year. The Jewish people have long known that the events in the larger world in a given week are often found and explained right in that week’s Torah portion. I believe that this creates in them an attitude of expectation. Do people who have spent years in their Torah study find themselves even looking ahead with expectation about what God might do in the coming week? Can it be presupposed and sometimes predicted? The Torah is the largest, longest-running Bible study in the world.